The image shown here is a 1916 flag based on my photo taken at the National Museum of Ireland, Dublin. A green flag, gold harp toward the hoist, in upper fly two crossed spears, and below on two lines the words III AUGHRIM. My family have in our possession some early nationalist/unionist materials from Ireland circa 1910-16 or thereabouts. 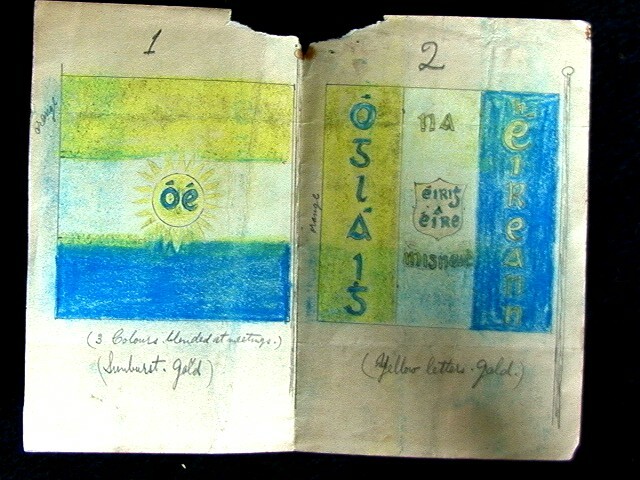 I present two sketches which I believe might be originals of, what were at the time, proposed flags or emblems for the Irish Volunteers and possibly Sinn Fein. I can't find out much about them off the web. 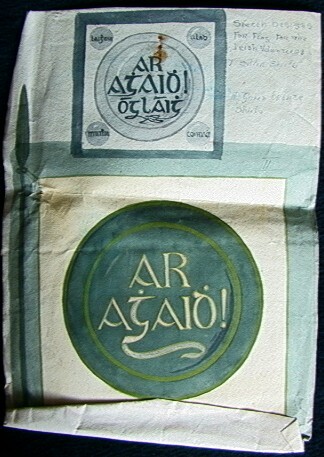 The text on the upper right of the second badge reads "Sketch Designs for Flag of the Irish Volunteers. I Silver Shields, II Bronze Shields"